This is Part III of a three part series on the Nature of Fractals. Readers can view the first two installments here: Part I and Part II. In the previous part of this series, I introduced the thought that quantum mechanics are related to fractals. That combination further implies the idea that quantum objects represent the combination of spirit and matter, which themselves exhibit fractal properties. A concept alluding to a transition akin to that seen in quantum mechanics can be found in mystic interpretations of the Hebrew alphabet. 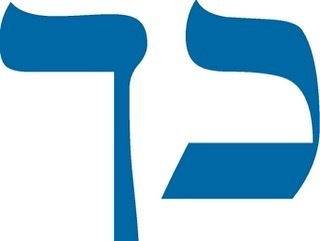 The word “kaf” is made up of two symbols from the first letters of two other words – koach, meaning potential, and poel: “…suggesting that Kaf enables the latent power of the spiritual (the potential) to be made actual in the physical…”1 The symbol kaf represents a palm with a Yod in its middle where potential becomes reality and hearkens back to the concept of a quantum object collapsing into its matter form. The combination of spirit and matter (see featured image) further suggests a direct link between Humanity and God. Our very thoughts may be thought of as quantum objects and underlie our reality, bringing into existence that which we interact with on a daily basis. Imagine a being, a being so advanced and evolved, that he is One with the Word – he is indistinguishable from the Word. His thoughts are very special – they appear in his mind as quantum mechanical potential energy and take on a life of their own. Within the thought, there is Life – spirit and matter combine to form consciousness, one facet of the being as described in the dual-aspect theory. In this manner, Sungsang and Hyungsang interact and form a human being. The thoughts or beings exist in the Universe of his mind, evolving themselves until they have each “had their due” and dissolve into nothingness. In this manner, each thought works to merge with the Word – thus further purifying the being. Thoughts beget thoughts of their own. which become fractal tessellations perpetuated throughout eternity. Fractals are left behind throughout the infinite hierarchy as evidence of the being’s work. At the End of Time, the being himself dissolves into nothing, a passing thought in a greater being’s mind. In the Mormon faith, it is the belief that each individual can progress to the point to inheriting a universe of their own. When one thinks about the Earth and the moon revolving around each other due to gravitational attraction, the Earth is an attractor for the moon. 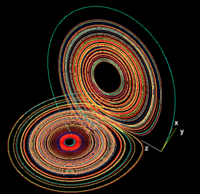 In chaos theory, the “orbital” patterns seen in the butterfly shape seem to form orbits around what are called “strange attractors.” The butterfly shape is described in terms of fractal dimensions, which means that the shape’s dimensionality is not an integer (2-D, 3-D, etc. ), but a fraction between two integers. So when we consider that fractals represent a form of order ubiquitous throughout Nature, it can be seen that they are indeed the embodiment of Ordo ab Chao – Order out of Chaos. 1 The Letter Kaf/Khaf, n.d.
2 “. . . the Matter of Marriage” [address delivered at University of Utah Institute of Religion, 22 Oct. 1976]) (Will Exalted Mormons Get Their Own Spirit Children and Worlds?, n.d.
4 Chaos VII : Strange Attractors, n.d. In the previous part of this series, I introduced the concept of a fractal. It is a construct which appears frequently throughout our daily lives and Nature herself. So what could be driving this self-similarity at multiple scales? It is my belief that quantum mechanics is related to the phenomenon. Recently, scientists demonstrated that quantum mechanics has fractal properties. (Dacey, 2010) Recalling some basics of quantum theory, sub-atomic quantum objects are thought to have both wave-like and particle-like (mass) properties. When a quantum object is in the wave state, it exists in a number of probabilities – a number of locations. When the wave function collapses, it becomes a definite particle of matter discernible by our instruments at a specific location. At this point, the particle not only takes on position and mass, it also takes on fractal properties. As alluded to by Dr. Pincus in his quote in the previous article, forming a fractal mass particle is very efficient and effective in terms of energy conservation. I believe that matter retains both wave-like and matter-like quantum properties no matter its form, just to varying degrees between the two. It is the wave aspect of matter that allows it to interact with other object waves. When a given particle replicates to either a smaller or larger scale, the primary form is determined by the original object at the smaller or larger scale (thus the similarity), but that form is affected by wave interactions with adjacent objects. Thus, the variability we find in Nature for naturally occurring fractals. In other words, if those interactions did not occur, then smaller and larger replications would be a perfect copy of the original. “Adjacent” particles do not necessarily correspond to normal concepts of space and time given the quantum mechanical property of entanglement, which states that a given particle can affect another particle at some physical distance. It is also my belief that this quantum object is the embodiment of Spirit and Matter – that the wave function seen in quantum particles is an indirect indication of the existence of Spirit. Our current instruments cannot detect or measure Spirit directly. Fractal mechanics in nature as described above suggest a dynamic relationship between the spiritual and the concrete – matter. A number of belief systems support this line of thought. An adjunct to Chinese philosophy’s Yin and Yang is the concept of Sungsang and Hyungsang. Where Yin and Yang describe attributes of an object, Sungsang and Hyungsang address the composition of the object – what it is made of. Sungsang refers to the non-visible aspects of an object while Hyungsang refers to the visible aspects of the same object such as mass, shape and the like. As an example, the Sungsang for a plant is Life. Both concepts are thought to stem from the Original Image, their origin. Sungsang and Hyungsang exists in every physical object, from minerals to plants to animals to human beings in that order to form a kind of hierarchy. As one moves “up” through the hierarchy, the higher form introduces new attributes while taking on those lower down in the hierarchy. So plants, for example, introduce “Life” as it Sungsang, but also inherits physico-chemical aspects from minerals. The diagram to the right illustrates the concept. Sungsang and Hyungsang is one additional way to view and explain our inter-connectivity with Nature. Another concept coming from the psychology of mind domain seems to exhibit aspects of spirit and matter as well. Dual-aspect theory or dual monism addresses the mind-body problem – how the mind and body interact and exist alongside one another. As can be imagined, because mental processes are involved, some of the theories can get kind of exotic – and dual-aspect theory is no exception. The combination is not the simple combination of the mental and physical, nor is it reducible beyond its normal form. The mental and physical are then aspects of the phental. A further refinement of the theory postulates that the phental is unknowable and that the mental and physical aspects are but a portion of the true self being exposed. This last part has some interesting implications and is a potential reference to what is stated above regarding the wave-like portion of a quantum object. As stated previously, I believe the wave-like portion to be an outward expression of the imbuing Spirit. This line of thought then makes one wonder what could be the underlying truth regarding the physical aspect of the phental. The study of the changing of base metals into gold seems to reach the top favorite of occult topics for many. Steeped in a rich history, all who study it have their various reasons for loving Alchemy and why not? What’s not to like? The idea that one can start out with an imperfect substance and through labor and effort transform it into one of the most precious and perfect metals desired is to be desired itself. Alchemy has a long history that modern science has reduced into one sentence of otherwise large and heavy textbooks — Alchemy failed. This statement hardly gives any indication that there were brilliant minds involved in this once noble science. Robert Boyle and Isaac Newton were no sycophants or charlatans and they were deeply respected (and still are) for their enormous and varied contributions to science. Why, then, did Alchemy not make the cut? The answer is quite simple — well kind of — Alchemists were playing with the wrong stuff. Fundamentally and generally speaking Alchemy is based on transformation. This is the process of taking a metal, like lead, and changing it into another metal, such as gold. In order to do this, an alchemist would need to reach into the center of an atom, into its nucleus (or essence if you would like to call it), and add or take away one of its major components: protons. This is no easy task. Atoms tend to really like their protons right where they are – at their center. This is because the number of protons provides the atom with a level of stability while giving them their identity. For example, hydrogen has one proton, helium has two, lithium has three, and so on. You can imagine how very important protons are. 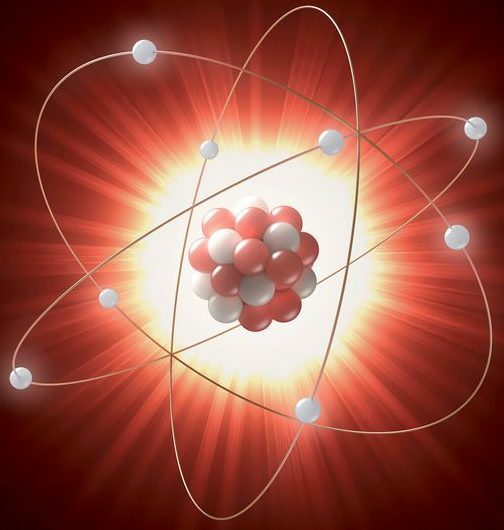 So much so, that atoms protect their nucleus with layers of small but really powerful particles called electrons. These super tiny subatomic particles are what alchemists were working with back in the day instead of the needed protons. To put it metaphorically, alchemists were working on the peel of an avocado rather than inside the seed. At the height of Alchemy, in the High Renaissance, the existence of protons wasn’t known so alchemists weren’t able to change their tactics to get things right. This is the reason transmutation continually evaded them… and why Alchemy eventually failed. Or did it? Modern science owes much to Alchemy. 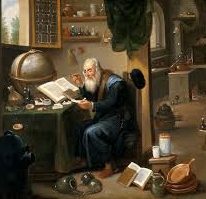 If Newton’s statement holds true that he saw further only because he stood on the shoulders of giants, then Chemistry today stands on the shoulders of Alchemy. It is because of Alchemy that advancements in the periodic table took place, that the nature of metals is more thoroughly understood, and the development of the atomic theory progressed from its proto-theories into our current quantum understanding. Can it be called coincidence that the Father of Chemistry is none other than the beloved alchemist Robert Boyle? I do not believe so. What the alchemists gave us, among other things, is better knowledge of chemical behavior. So did Alchemy fail in its purpose of transmutation? Yes, it did. But it didn’t fail us all together. Imagine an old laboratory room full of musty and sour scents with bubbling concoctions of a variety about it. Sitting at his workbench is a hunched-over bearded man, deep in contemplation as he stares intensely at the flask in front of him. It isn’t a difficult scene to picture but what is harder to imagine are the silent and mysterious thoughts of this unknown man. Why is he looking at the blackened substance with such complexity? With such expectation? It is because that mass of material represents his very essence, and he doesn’t understand it. Not one bit. You see Alchemy isn’t just about transformations of materials like its successor Nuclear Chemistry. It is about tying one’s personal evolution and transformation to that lump in the flask. This prima materia, as it is called, is the proxy of the alchemist and he will make it undergo numerous experiments. The constant subjecting of the substrate to fire, acid, and time is emblematic of the alchemist unlocking the conditions and behaviors that block him from reaching perfection or the Philosopher’s Stone. This stone is achieved only through the agony of self-scrutiny and long hours at the workbench. It represents gold or the perfected material and is the ultimate achievement of any alchemist, if accomplished. There is something profound and beautiful about this intense exploration and application. Alchemy is the very symbol of Man realizing that he, at his most basic level, is no more understood than the substrate he has captured in his round bottom flask. And that he can become more than this undefined mound if he truly works for it. Alchemy failed on one level but it has found supremacy on another. There is more than value in trying to understand our human nature through the nature of other things. That value is purpose and we find it through personification. Personification of our universe has been our means of communication with it. The laboratory has been and can be another way we personify our hidden nature. It enlivens our senses like no textbook can. And our senses are the gateway to experience and authentic knowledge. We should look to Alchemy as a spiritual method of self-discovery and actualization and not a valid empirical science of transmutation. The latter holds no future in its outdated form, but the former holds the potential of all of our greatness. This is the third of a rambling three-part exploration of Middle and Dark Age Europe, birthplace of much myth concerning Western religious and esoteric teachings. Never was myth and make believe more true than with the Merovingians. There is a pain over my left eye when people talk about how the Merovingians were the descendants of Jesus Christ and Mary Magdalene. It begins as somewhat of a sinus headache, moving into full blown brain burn as the person goes on about how it was possible and descendants of Christ are alive and well and are French. They go about this by tying the fish symbology of the early Christians to the name Merovech, assumed founder of the Merovingian dynasty. Thanks, Dan Brown, And Christopher Knight. And Robert Lomas. In my younger days, I too went down this path of how-history-gets-corrupted-by-pop-culture and fell down a deep rabbit hole researching the Knights Templar. Inevitably, this lead me to the Cathars and Merovingians, Lomas and Knight, and yes, I was a swirling mess of mythology masquerading as fiction masquerading as fact. Of course it could have happened. Of course. It’s right here on the Internet. I finally grew up, after a few smackings from real historians, and got on the bandwagon of facts. Like a reformed smoker, I went whole hog into finding out “true” history. My library is a testament to finding a glimmering moment of fact amongst the ashes of primary sources. Primary sources and logical research are the keywords everyone who wants to know about history should revere. The sensational is fun but it certainly isn’t always, maybe usually, true. Another historian and researcher taught me early on that “real history is generally way more interesting than what people make up.” He was right. With the Merovingians, the history is nowhere near as exciting as most people think. The founder of the dynasty was Merovech, whence the name Merovingians emerges. Merovech was the first to unite the barbarian Franks into a kingdom commonly known as Francia, later France. The Franks were, up until this time, a loose confederation of different tribes, warring as the Roman Empire fell apart. Around 458, Merovech’s son Childric I successfully won ground against the Visigoths, Saxons, and Germanic tribes to unite the Franks into common cause. However, it was his son Clovis I who united most of the northern Franks into a single kingdom to battle against the remaining Romans and Germanic tribes to form Francia. The dynasty continued for three hundred years, when they finally succumbed to inter-kingdom strife, the influence of the Christian Pope, and personal feuds. It wasn’t a particularly glorious end to a long-ruling empire; it was more a very human one. Many people believe that the beginning of the country of France began with Clovis uniting all of the different Frankish tribes under his rule, and he set the tone for how the future of France would evolve. Hence, the Merovingian dynasty has a place in the heart of the modern French psyche. It’s no wonder that a strong, late 20th century mythology built on a hoax would stir the French as well as the rest of the world. Pierre Plantard, in the mid-20th Century C.E., created a hoax which involved forged documents, a “secret” of regal lineage, and co-conspirators that would make even the best con man proud. Over the course of thirty plus years, Plantard promoted an organization named the Priory of Sion, purported to have created the Templars, discovered hidden documents found in Rennes-le-Château proving the bloodline of Christ was really Merovingian, amongst other things. The entire setup was an elaborate hoax that perpetuated until the late 1990’s when the entire fraud was brought to light. Not before, however, several “historians,” fiction writers, and even “60 Minutes” were dragged into strengthening this mythology. Books like “Holy Blood, Holy Grail” and “The DaVinci Code” have perpetuated and sensationalized the stories until the claims have become a little insane. Rennes-le-Château was in the heart of Cathar territory and claims about the Church of Mary Magdalene increased the myth. As we discussed previously, the Cathars revered Mary Magdalene, so it is no surprise that there is a church in her honor in the Cathar “homeland.” By tying the mythology of the Merovingian fish, an elaborate birth tale of Merovech’s parents being part woman and part sea God, the idea was this must be a secret message that the Merovingians were tied to the lineage of Jesus Christ and Mary Magdalene, who brought herself and the Christ’s unborn child to France when Jesus was killed. You add to this the spice that Mary must have carried the Holy Grail, or that she was the Holy Grail, sprinkle it with a few false documents and true biblical references, and you have the makings of a great feast of fiction and conspiracy theory. Killjoy, I hear you say. Let’s just say, I think the facts make a much better story. We don’t need to sensationalize to get a good dose of interesting intrigue and human strife, tragedy, and hope. The Merovingians were an interesting story unto themselves, having been really the first rulers of a modern France. They established cultural identity that lives to this day and can be seen in the remnants of laws, mores, architecture, and language. They established a rule that was the precursor to feudalism and were strong supporters of the early and medieval Catholic Church. Dozens of Merovingians were prominent church leaders and/saints. The Merovingians were the seeds of a long and deep nationalism that affects world thought today. This is why they are really to be remembered and discussed. Freemasons search for truth and in their own origins, I would think they would search hardest. There are elements of the Knights Templar, the Cathars, and even the Merovingians in the foundation stones of Freemasonry. How could there not be? These were groups whose ideas and ideals were radical for their time; groups of people who formed new ways of being and thinking in their time periods, from the early 5th Century all the way through the late Middle Ages. Rebels. Mold breakers. Liberators. For people who are themselves trying to change the world for better, I can’t really think of better icons. Whenever the Templars are mentioned, the Cathars are generally not far behind. Tied together with some interesting data and facts, they tend to be the focus of intense esoteric and mystical knowledge. Taking a look at them with the facts we have may answer questions, or create deeper ones. The Cathars were the followers of a 12th to 14th C.E. Gnostic movement in Southern France and Italy. This movement, Catharism, comes from the Greek word katharoi, or “Pure Ones.” Scholars agree that the people who practiced this religion did not call themselves by this name; in all honesty, it seems unclear what they did call themselves except “The Good Christians.” The movement first took hold in the small town of Albi, in France, and the followers were also known as the Albigensians, especially to the Catholics. The ideas of Catharism were around for centuries before this larger movement took place, and possibly has its roots in what is called Paulicianism. In the Paulicianism belief system, the adherents do not believe in the Trinity (Father, Son, and Holy Spirit), and in fact believe that Jesus was “adopted” by God to be his “son” and endure the necessary trials. Paulicianism was vibrant around the 7th to 9th centuries C.E., particularly in Armenia. Cathars, like the Paulicians, primarily believed in a dualistic Christian system, wherein the were two “Gods,” one good, one evil, as well as deeper Gnostic concepts. The basic tenants of the Cathar religion seem to have come from a single priest, Bogomil, during the First Bulgarian Empire in the 10th century C.E. as a response to the rise of feudalism. In other words, the oppression and slavery of Feudalistic ideas spurred this priest and his followers toward a mindset of individual freewill and worth. Like later Cathars, Bogomilism did not believe in the ecclesiastical hierarchy nor did they believe in the need for church buildings. In a sense, Bogomils, and then Cathars, were an itinerant religion, spread by men and women of the church elite – Travelers. Most of their beliefs were radical to a still-struggling Catholic Church, and in a time prior to Luther, Catholic ideas were the only “Christian” meal to be had. The church had struggled for over a thousand years to get itself “right,” and it did not need yet one more renegade group to get in its way. Cathars believed in reincarnation of humans and animals, and did not eat the flesh of animals for this reason. They had a vibrant tradition in their troubadours, and were traveling craftsmen of many trades. Men and women were mainly seen as equals, although it is thought that their last incarnation needed to be male in order to be “close to God.” Their Good God was the creator of all that was spiritual, ethereal and thought, while the Evil God was the creator all that was material. They did not believe in hell, it being the earth in which we currently live, but heaven was populated by angels and spirits performing the will of the Good God. By living their aesthetic life, they believed themselves to be the truest Christians, where the Catholic Church was a corruption of all of the Christian teachings. Cathars had two levels of knowledge, for lack of a better term, to distinguish the teachers from the lay follower. Know as “Perfects,” or “Parfaits,” both men and women could be come one of the elites and were both known to travel and spread the doctrine. This seems to mimic some of the early Christian sects, who also adopted from the Cult of Mithras, Bacchus, and a few other mystery schools. What is important to note as that for the first 500 to 700 years of its life, Christianity was nowhere near the juggernaut that it became in the 14th to 19th centuries. Out of the remains of the Roman Empire, the Catholic Church rose to reinvent itself to be that empire once again, using religion instead of soldiers to find its way. There was not just one Council of Nicaea but seven over the course of 400 years. The doctrine of the church was not set in stone – more like several tributaries that were flowing to a single great river. It took hundreds of years and thousands of theological discussions to get to where it is today – still fragmented but fairly solid. It is in the period of the Bogomils and Cathars that we see the Catholic Church coming into its own power, and asserting its right as the divine authority over layman and royalty alike all through Western Europe. It is also important to remember that this was a time before Luther – before the idea that the human could come to God in other ways and not via their connection to a priest. At this time, the spiritual afterlife of every person lay in the hands of the Catholic Church. Clearly, the Catholic Church had money. And royalty. There was not much that was going to get in the way of it becoming the dominant force in Western Europe. In fact, many new ideas of suppression were tried on the Cathars, tools the Catholic Church would further expand as it moved through Europe imposing its will. The Catholic Church did see the Cathars as a heretical sect; yet, they debated whether they were even Christians. Either way, they could not survive. In 1208, Pope Innocent III declared a crusade on the Albigensian region of Languedoc, which was not part of France at the time but its own kingdom. Known as the Albigensian Crusade, or later by the name of Cathar Wars, the killing of human beings was indiscriminate. Many Catholics, Jews, and Cathars died in these wars. This genocide bred the first use of the now-common phrase, “Kill them all. God will know his own.” This was the first time a crusade had been waged within the confines of conventional Western Europe, and by all accounts the Catholic Church called it a success. This was followed by what would be called the first Inquisition, whereupon torture and death were used to force conversation back to the true religion, Catholicism. The Crusade itself was ended in 1244, the date when the castle at Montsegur fell to the crusaders. The Inquisition continued well into the 14th century. The last known Cathar elite (called Perfect, as was their custom) was burned there in 1321 C.E..
Cathars did continue to exist in hiding and by all accounts, had eventually died off as a continuing sect. There are some who believe that that elements of the Cathar religion rose with Luther and Protestantism but there are no real supporting documents or links to this supposition. Additionally, there was and is a supposition that the Cathars held a secret “treasure” which was spirited away prior to the fall of Montsegur; no evidence has been found of this treasure, although some believe it is knowledge rather than an actual treasure. There is also an idea that this treasure went to the Knights Templar, who were just being formed. Indeed, the one link between the Templars and the Cathars was Bernard of Clarvaux, later St. Bernard. Bernard is seen to have held some of the same ideas of the Cathars, even if he did see them as heretics to be eradicated. He had continued correspondence with a bishop of the Cathars and indeed visited. Bernard was also prominent in bringing the worship of the Virgin Mary to popularity, which was in keeping with Cathar beliefs. The Cathars were and are an interesting off-shoot of the Christian religion from its earliest days, and it is a shame that not more of its own writings exists. Many have speculated if the Cathars still exist and if so, in what form. It may just be a single, dead branch of a tree that has its roots in far older and mysterious teachings. There are a few books about the Cathars; the one by Malcom Barber, who also wrote about the Templars, is interesting and factual. There is also another book about a woman who remembers her past life as a Cathar, in the 13th century C.E., titled “The Cathars and Reincarnation,” by Arthur Guirdham. It is relatively short with some descriptions of places and drawings associated with them. It is an entertaining read, and will leave it up to the reader to validate their own beliefs about the teller’s story. There is also a very thorough website, which has a lot of great references for anyone who wants to know more. I recently attended a Masonic Philosophical Society discussion about compassion – what was it, what is it, and how did it get from there to here. In the course of the discussion, many people discussed kindness and manners but little discussion about compassion took place. The word comes from the roots of ‘with’ and ‘passion.’ The modern, Webster’s version of the word means, “sympathetic pity and concern for the sufferings or misfortunes of others.” As language evolves, and many of the things that philosophers study are dusty with age and wear, it was important to see where the word began. From its Latin beginnings through Old French, the word actually meant “suffer with.” From the 14th Century C.E. backward, the word is associated with suffering. To look at meanings, suffering and sympathy/concern are two wholly different experiences. What is interesting is the the word “suffer” also comes from the Old French, in about the same time period as compassion, and the word originally meant “the be under the burden of something, to ensure, to hold up.” The word sympathy shows up much later in vocabulary, around 1570, and is of two Greek roots – “together” (sym) and feeling (pathos). In his book, “Sympathy: A History,” author Eric Schliesser puts the confusion between sympathy and compassion to rest. He breaks down, right in the introduction, the differences between sympathy, empathy, and compassion. Sympathy and empathy, which are often confused for one another, are different breeds. Empathy, a word from the 12th century C.E., was created, the author states, to describe the German concept of Einfuhlung, or the state of entering into someone else’s feelings. That is, in empathy, the person is actually “in” the emotions of others, whereas with sympathy, the person experiencing it is recreating what their imagination can create, from the building blocks of society, family, and learned experience. The person in sympathy is not actually feeling the same emotions as the person conveying the experience. So, the question bears asking: are compassion and empathy related? How can one suffer without actually feeling the suffering? In other words, you need to have both empathy and sympathy to be able to motivate yourself to compassion. Compassion is also action; it is the desire to relieve the suffering of the other person with real and meaningful work. The interesting difference between kindness and compassion is in the suffering. It is kind to hold the door open for people. It is compassionate to bring someone into your home and away from the cold. Kindness involves a gentle mindset and may be necessary for compassion; however, compassion demands more. It demands action that is substantial enough to relieve true suffering, a true burden. It’s not taking the burden off someone’s shoulders, or living the pain with the person. That achieves nothing. It is not only lifting the burden with someone but working on ways to bring the cause of the suffering to an end. The compassionate person has distance from the emotional weight and can therefore see more clearly what may be accomplished. In conjunction with the other, that clear-headed person can provide a guide through the suffering. Compassion requires a higher thought, a higher attention to the greater good. It also seems to require an integrated person – someone who can truly see the person in all their different forms and deliver what is required. Compassion isn’t kindness. Kindness is a quality of being gentle and generous. Empathy is the ability to actually feel the suffering of another, while sympathy is the ability to imagine that suffering. Compassion takes all of those facets and creates an action plan. We might equate kindness with the physical, empathy with the emotional, sympathy with the mental, and compassion with the spirit, if we were breaking this down in the sense of human experience. The highest emotion, in this human drama, then, is compassion. It requires the most energy, delivering the most gain. In other words, sometimes the kindest, and toughest act of compassion may appear to be harsh of difficult for the person to achieve. Saying “no” to the alcoholic is compassionate, as is saying “no” to the person who always wants the answer. Telling the intelligent person that their poor work is the result of laziness is kindness, empathy, and sympathy rolled up into a greater purpose – it is compassion. Enablement is not compassion: it is destruction. Freemasonry teaches you how to act but not how to think or feel. Freemasons are regularly taught to be kind and compassionate, yet subdue strong emotions in favor of thoughtful discourse. Freemasonry also teaches you to act instead of standing on the sidelines and watching and simply thinking about a thing. Freemasonry provides opportunities for its adherents to be able to speak openly and view themselves authentically. Everyone requires a second set of eyes and experiences to become better, and it is in the bonds of fraternal love that compassion can be delivered. It requires different thought than the general society. It expects the Mason to not only learn to be compassionate but also to be able to receive that compassion. It becomes a true bond of fraternity, when honesty is the cement that not only binds us but supports us. Are Freemasons perfect? Not by a long shot. It is in the compassion found in fraternal bonds that Masons can become better human beings and thereby better members and examples in the larger society. “The word “egregore” derives from the Greek word egrégoroi meaning “watchers.” The word appears in the Septuagint translation of the Book of Lamentations, as well as the Book of Jubilees and the Book of Enoch. Gaetan Delaforge, in Gnosis Magazine in 1987, defines an egregore as a kind of group mind which is created when people consciously come together for a common purpose.” Think of groups coming together to build something, like Habitat for Humanity, or like the feeling of a synagogue that prays together for a common cause. Even those examples might not be quite right. It’s more of the feeling that comes from doing the work in a group, of like-minded people. Being in the midst of the common mind working for a specific purpose, which feels powerful. Transformative, even. Egregore implies, by its definition, spending time and energy to create something. This word, egregore, came up recently in a conversation with a fellow Mason, and I wondered at its true meaning. It isn’t a word in my everyday vocabulary and not one I had heard or used more than maybe once. It was time to brush up. I found an astounding number of occult meanings and, to be frank, made up ones as well. The word was first used by Victor Hugo, and the root is noted above. But, the idea of egregore is, I think, difficult to put into exact words. It’s kind of like other concepts of “good” and “bad” – you may not have the adequate words but you know it when you see it. Egregore is similar: We might “know” what it means and we have seen it, and felt it, in action. Yet, saying the meaning of the word, as a feeling, feels, frankly, a little “woo-woo.” A little fluffy, new-agey, and weird. Yet, all of us knows that it does exist. There are some who feel that an egregore is an entity unto itself; the being is a collection of spiritual, emotional, and mental energies put forth by a group of people with a single purpose in mind. We don’t know that it has a consciousness of its own; rather, it could be that it ebbs and flows as the group “moves” through its work. In well-done ritual, the egregore can be felt moving among the members of whatever group is working toward the goal. In Freemasonry, we might think of egregore, as the pinnacle of a Freemasonic ritual: all members working together to achieve the goal of promoting the best welfare of humanity, combating ignorance and hate, and striving to bring beauty and wisdom into the light. Think of any ritual, religious or otherwise, that felt incredible and think of what made it feel that way – THAT is egregore. I think that Leadbeater alluded to it in “The Science of the Sacraments” in his discussions about censing the Church space. A Masonic blogger, E.C. Ballard, wrote the following, “So, what does any of this have to do with Freemasonry? The symbols, rituals and meetings of a group, when repeated over time, develop an egregore or group mind which binds the members together, harmonizes, motivates and stimulates them to realize the aims of the group, and enables the individual members to make more spiritual progress than if they worked alone.” This is why, perhaps, all symbols have meaning – more than the one we discern from their location or use in Lodge, church, or temple. We smell the ritual incense and this brings our hippocampus to a place of Order and Structure – the temple or church room. It’s the shivers we all get up our spines during any initiatory ceremony, when certain names or elements or musical sounds are invoked. The Freemason’s ritual, by its very nature, followed correctly creates this egregore. This is really what I mean about being able to identify a Masonic egregore. I once wrote, in a personal essay, “I don’t know exactly how Freemasonry works, but it does work. I am a far better person today than I was before, by applying Masonic principles and being open to learning. Had those two things not come together, Freemasonry would not have worked.” So, for me, egregore is the “work” achieved by a group mind, coupled with the willingness to receive that work. Sounds remotely like discipline, doesn’t it? Interestingly enough, both group mind and willingness are addressed by the structure of Freemasonry. First, the willingness to work, well, that’s a given. Members come to the group of their own free will, and they can leave of their own free will. Freedom of choice is the purest example of a willingness to work. If we don’t want to do the work, learn the lessons, or put in time, why do we stay? We shouldn’t. Freemasonry doesn’t or shouldn’t bend to our will. It’s not about us. It’s about us conforming to the rules and regulations and more than that, being willing to be honest with ourselves about being there. If we’re not willing to submit to Masonic discipline, why the heck are we there? Why spend the money, time, and effort to attend? It’s far better for the individual and the group if the person chooses one way or the other and then just does it. The second item suggesting egregore, creating the group mind, is far more difficult to qualify. In contemporary articles on leadership, there is a concept called emotional intelligence. “Emotional intelligence (EI) or emotional quotient (EQ) is the capability of individuals to recognize their own, and other people’s emotions, to discriminate between different feelings and label them appropriately, to use emotional information to guide thinking and behavior, and to manage and/or adjust emotions to adapt environments or achieve one’s goal(s).” The term has been thrown around psychologists for fifty years but it has only recently (1990s) been the subject of business and leadership roles. The basic premise is this: in order to build effective teams, everyone must be working at their highest level of emotional intelligence, which develops trust, and eventually creates a team that is able to do anything towards which they put their minds and efforts. Emotional intelligence develops “corporate culture”, which is like Masonic egregore. The ritual brings a physical demand in our lives; study and philosophical discussions bring mental stimulation. 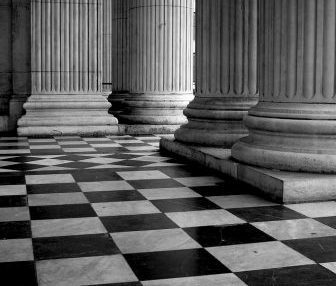 Many forget the emotional component to Freemasonry and that is emotional intelligence – how we dispense justice, how we reprehend, our voices when speaking with people – things the ritual instructs us in on how to live. By combining the first two, physical discipline with study and mental exertion, with the third, well-regulated emotions, we get Freemasonic egregore. At least, it appears that way. Maybe the concept of the “Lodge” or maybe even “Freemasonry” is itself an egregore. I think we have to test this Masonic egregore theory for ourselves. How does Lodge make us feel? How does well-rehearsed ritual sound and express itself? Do we feel satisfied when the pieces work well together? How do we feel when they don’t? How does it feel to stand in a Lodge room alone? What about with other members? What happens when there are three people attending a meeting versus fifteen? What happens to the Lodge when one or two members are not “hooked in” and trusting the Lodge, the Master, or the Order? With Freemasonry, it feels as if one needs to be “all in” in order to even start to build a true Masonic Lodge: a curated collection of people coming together in a thriving and growing group that finds, eventually, its own brilliant egregore. Perhaps that is what we are searching for and why Freemasonry appeals to us human beings. The mystical experience that some members hope to find is really this egregore that, in some ways, we are all hoping to find. We all want to make a place in the world – leave our mark or our legacy. As Freemasons, that is a better humanity. Masons seem to be searching for that community that brings us hope, trust, and peace. Finding it takes a lot of work, it seems. Touching the egregore for a moment provides perhaps a brief insight into what the Divine really is like. When we encounter what seems impossible, the solution can often be found where we might least expect it. By expanding search parameters to include information that appears paradoxical or unconventional, we can create a shift to innovation. To many, the concept of mining ancient medical texts for cures to modern diseases might seem like a waste of time. One woman’s curiosity, however, led her to do just that. When she joined forces with other open-minded researchers, they were shocked to discover that one ancient recipe was uniquely effective on the modern superbug, MRSA. During the past four decades, the public health impact of antibiotic-resistant bacteria has evolved from a controllable nuisance into a serious concern. Staphylococcus aureus or “staph” bacteria commonly live on our skin and in our environment, however, they can get inside the body and cause serious infections. When common antibiotics cease to kill the staph bacteria, this type of staph is referred to as MRSA (Methicillin-Resistant Staphylococcus Aureus). The symptoms of MRSA depend on the infection site. In the majority of cases, MRSA causes mild infections on the epidermis, like sores or boils. However, the bacteria can also lead to serious infections of surgical wounds, the bloodstream, the lungs, or the urinary tract. Allowed to develop into mature growths, MRSA infections can become deadly. Perhaps the most worrisome component of the bacteria is that it is spread by contact: touching another person or objects that have the bacteria on them. Referred to by scientists as a modern superbug, MRSA has become a worldwide problem due to the inability of antibiotics to effectively treat the bacteria. Epidemiological studies in the United States and Canada demonstrate a 17 percent increase in reported MRSA cases over an eleven year period beginning in 1995. According to the U.S. Center for Disease Control and Prevention (CDC), approximately 94,000 people developed their first invasive MRSA infection in the United States in 2005. Of the 94,000 infected, 19,000 of the infected individuals died. Acknowledged by the CDC as ‘public health’s ticking time bomb,’ antibiotic resistance threatens to return our world to the time when simple infections proved fatal. A 2014 study commissioned by the U.K.’s Prime Minister reported that by the year 2050, antibiotic resistant infections are expected to kill 10 million people each year, which is more than currently die from cancer. In response to this growing crisis, President Obama’s Fiscal Year 2016 Budget requested a doubling of the amount of U.S. federal funding for combating and preventing antibiotic resistance to m ore than $1.2 billion. Dr. Christina Lee had an idea. 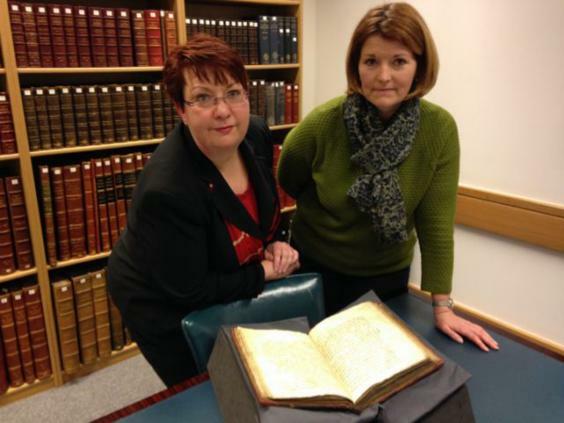 A Professor in Viking Studies at the University of Nottingham, she was curious as to whether remedy’s from an ancient medical text, Bald’s Leechbook, might prove effective against modern diseases. Containing Anglo-Saxon recipes for medicines, salves, and treatments, Bald’s Leechbook is one of the earliest known medical textbooks, which is thought to originate from the 10th Century. With her translation of Bald’s Leechbook, Dr. Lee turned to her colleague, Dr. Freya Harrison, a microbiologist at the university. Together with other researchers from the University of Nottingham’s Centre for Biomolecular Sciences, the team decided to recreate an “eye salve” recipe from the text that listed two species of allium (garlic, leek, or onion), wine, and oxgall (bile found in the stomach of a cow). The recipe included precise instructions for the concocting of topical solution, includ ing the use of a brass vessel for brewing and a specific type of purifying strainer. The mixture was then to be left for nine days before use. “We recreated the recipe as faithfully as we could. The Bald gives very precise instructions for the ratio of different ingredients and for the way they should be combined before use, so we tried to follow that as closely as possible,” said microbiologist, Freya Harrison, who led the work in the lab at the School of Life Sciences. The researchers made four samples of the “eyesalve,” while also creating a control treatment. 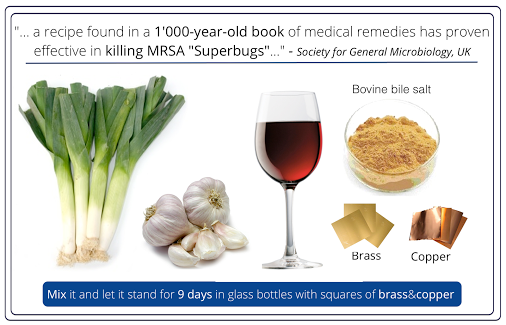 While none of the individual ingredients alone had any significant impact, the combined “eyesalve” almost totally obliterated the MRSA infection. Approximately one bacterial cell in a thousand survived in mice wounds. One member of the team, Dr. Steve Diggle, stated, “When we built this recipe in the lab, I didn’t really expect it to actually do anything. When we found that it could actually disrupt and kills cells in the (MRSA) biofilms. I was genuinely amazed.” For while modern antibiotics can treat early infections, MRSA’s impenetrable reputation comes from the biofilm it builds around mature infection sites which antibiotics cannot breech. Thus, Bald’s “eyesalve” demonstr ated the ability to do what antibiotics could not. The U.S. National Institute for Health (NIH) reports that biofilms are implicated in up to 80 percent of all chronic and recurring infections. Biofilms serves as shields that protect bacteria from attacking antibiotics and other treatments. In addition, Biofilms allow bacteria to stick to medical implants, tissues, and other surfaces. Freemasonry rejects dogma, teaching individuals to think for themselves. Merriam-Webster defines dogma as “a belief that is accepted by the members of a group without being questioned or doubted.” Since the germ theory of disease was not really fully developed until the 1870s, what new information could be gained from a medical text from the 10th century? While dogmatic scientific thinking may have precluded research into text such as Bald’s Leechbook, the team of researchers from the University of Nottingham in England and Texas Tech University stepped outside the realm of conventional sources for scientific study. Their efforts provided a needed catalyst in solving the growing problem of antibiotic resistant bacteria, such as MRSA. Who put the Enoch in Enochian? “Enoch was son of Jared and fathered Methuselah. The text of the Book of Genesis says Enoch lived 365 years before he was “taken” by God. The text reads that Enoch “walked with God: and he was no more; for God took him” (Gen 5:21–24), which some Christians interpret as Enoch’s entering Heaven alive.” (Wikipedia) This is what I learned about Enoch early on in my “Bible as Literature” class in high school. I was intrigued and the name of Enoch stayed with me ever since. “Walking with god” took on so many different meanings – he was transported to heaven and his physical body never died, or that he died painlessly because of his “righteousness” were two classical interpretations. As I’ve learned, there are other views of who and what Enoch might be. These books talk about first the fall of the angels who were alleged to have fathered the Nephilim, as described in Genesis. The rest of the books are writings about Enoch’s revelations about and travels to heaven, either via visions or dreams. Some of the concepts discussed in these books are interesting and could have been controversial to the first Christian church leaders. The books contain histories of the fallen angels and their interaction with human kind, Enoch’s travels through what might be considered the underworld and heaven, a discussion about the Tree of Life, who the seven archangels were, parables on living, descriptions of heavenly bodies and their movements, and much more. Fragments of The Book of Enoch can be found in other writings of the old and new testaments, other apocryphal works, and in the Quran. The Second Book of Enoch is also known as “The Secrets of Enoch,” and tells the story of how Enoch was transported to and through heavens, and further relates tales of the war of angels. There is a Third Book of Enoch which exists, and the Book of Giants, which is attributed to the same time period and relating to the same topics. (Mary 19:56–57): “And remember Idris in the Book; he was indeed very truthful, a Prophet. And We lifted him to a lofty station”. Some Jewish scholars think that Enoch became the head of the angelic host, Metatron. Edgar Caycee, a Christian fundamentalist and traveler to “the realms of the dead,” has a very elaborate reincarnation lineage of Jesus Christ, of which Enoch was one incarnation. To Caycee, Enoch was also Hermes (Thoth), the priest Joshua, and a few other incarnations. While this is interesting, we have not addressed the idea of “Enochian.” What is it? Enter John Dee and Edward Kelley (a.k.a. Talbot). Much has been written about John Dee, and much of it dismissive. However, he was an extremely learned man with a fervent desire to heal the rifts between the Catholic Church, The Church of England, and the Protestant sects in mainland Europe. He was a devout man, and while we might understand how this can all work together, he was a scientist, alchemist, and occultist. In his desire to mend the religious wounds of the time, he sought to discover the original language, the language of God and Angels. In doing so, he felt that he could bring about the unification of humanity. Not being a medium or scryer himself, he turned to both his son, Arthur Dee, and eventually to Edward Kelley, a younger alchemist and spirit-medium. For eight tumultuous and energetic years, they worked together with Edward relating the Angelic language to John Dee through a series of seances and spirit conferences. Dee’s writings have been republished and in the web archives and by some publishing houses. Copies also exist in the British Library. The language that Dee and Kelley uncovered or created (some debate exists, of course), was called by Dee the “Angelic” or “Adamic” language, as it was the supposed language that God used to create the universe, that Adam learned from God, and what Adam used to name all living things. The idea of an antediluvian, singular language was very popular at the time in the Western world, and seeking it was one of Dee’s highest priorities. 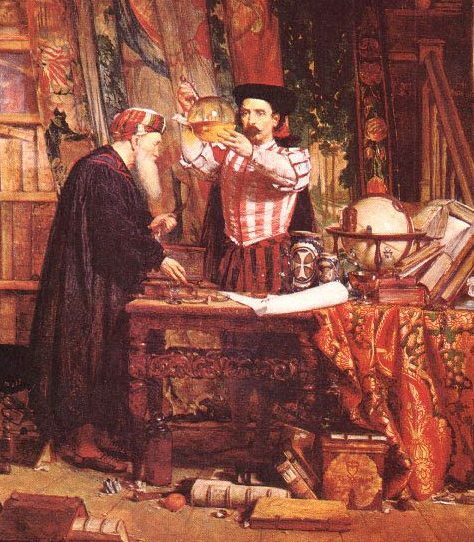 He was a mathematician, philosopher, astronomer, cartographer, and navigator. Even though he is known more for his “magical” leanings, he was an extremely well educated man. He was also a follower of Neo-platonic ideals. If one reads some of Dee’s journals or diaries of this work, one can see some of the occult influences that came into Freemasonry at a later time, and are evident in several Masonic rituals, especially in the English rites and Scottish Rite higher degrees. Elias Ashmole, who was the first to document the date of his speculative initiation, followed Kelley and Dee’s work closely. In fact, he reproduced some of Kelley’s documents and created a Biography of John Dee. Ashmole’s notation of his speculative initiation has undergone a fair amount of scrutiny, which will not be replicated here. He seemed to have an influence with many people who were swirling around the Speculative Masonic world. It’s hard to believe that someone of Ashmore’s experience in the sciences and esoteric studies could not have influenced an organization he was a member of for decades. He’s well known for having written “The Institution, Laws, and Ceremonies of the Order of the Garter” in 1672 as well as being a member of the Royal Society. The author in the book noted below that “Ashmole was a joiner,” and joining a society of Freemasons seemed to be the thing to do at this time in England. It’s somewhat apparent that as his time as a Freemason went on, he did exert further influence. An excellent book to read about this time period, and about John Dee, Kelley, and Ashmole is “The Golden Builders,” by Thomas Churton. It is a deeper historical account of these persons than can be given here. 103:2 “I know a Mystery | And have read the heavenly tablets, | And have seen the holy books.